Our first look at InXile and Bethesda’s co-op-focussed attempt to rejuvenate the traditional dungeon crawler. ‘Gears of Dragon Age’. ‘Army of Two Worlds’. 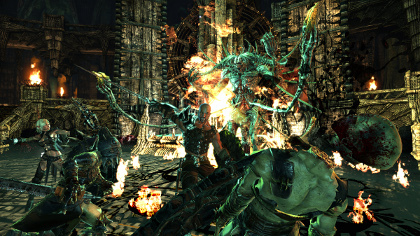 A couple of phrases you may see floating around in connection with Hunted: The Demon’s Forge, an original third-person action-RPG unveiled to the public today for PC, PlayStation 3 and Xbox 360. VideoGamesDaily was on the guestlist for the press reveal last month, and while those off-the-cuff comparisons carry a certain weight, we found there was more to the new game than first met the eye. Developed by InXile Entertainment, the brains behind 2002′s raucous RPG spoof The Bard’s Tale, and published by needs-no-introduction Bethesda, Hunted aims to ‘bring the classic dungeon crawler back’ in all its brooding, blood-soaked, isolationist glory. Players take charge of either the hulking, bear-chested Caddick or strapping, bare-chested Ilara (did you see what I did there etc), a mercenary duo dispatched to a massacred township in search of crystals by an enigmatic spectre. The demo opened on an almost Silent-Hill-esque note, lingering over the tattered spectacle of the town itself, with its flapping awnings and gutted households, but when Creative Director Michael “Maxx” Kaufmann seized the controller the afore-hinted parallels took centre-stage – or off-centre-stage, as the game’s camera would have it. While the weapons on offer are thoroughly old skool (bows, blades and magic) Hunted’s basic mechanics are those of a more contemporary breed of action title: lock-to-cover, precision aim and rapid fire. Never lose your head in a boss fight. Co-op play (whether online or with the AI) is the key area in which InXile hopes to distinguish itself. Ilara and Caddick are derived from familiar archetypes, he stronger and tougher, she faster and more able at range, but the developer has teased some interesting new threads out of that time-honoured double act. Magic, for instance, can be used directly on the game’s Orc-like enemies, fireballs arcing through the air like mortar rounds, or to ‘battle-charge’ the other character, temporarily boosting their attributes. Caddick can levitate foes into Ilara’s line of sight for easy headshots; she, in turn, might freeze his adversaries with ice arrows. Each character has three skill trees, and experience points from kills are divided equally between the pair. Kaufmann drew a line under the idea of ‘co-op at a distance’. Characters can patch each other up wherever they are in an area, tossing healing vials with unfailing precision. This, he explained, will allow players to get the utmost out of some extremely attractive, grandiose Unreal-powered environments, exploring different routes and combat vectors. We’re a little worried that being able to heal at range could encourage players to split off and fight their own battles: those instances of teamwork between Ilara and Caddick we saw might have been engineered for the purposes of the demo. Don’t quote us on that till a hands-on opportunity arrives, though. Besides the forces of evil, Hunted’s tumbledown underground temples and tunnels feature a promising array of puzzles: one early specimen involved lighting an arrow on fire and shooting it into the eyesocket of a talking stone head to clear the path. Of these conundrums, around 40 per cent will be ‘challenging’ while a privileged 20 per cent are said to be ‘nigh impossible’; most will be optional, but new weapons and equipment await those who take the trouble to solve them. Combat has its puzzle aspect, too: at one stage, Caddick shoulder-barged a weakened pillar to flatten a distant catapult. We're not sure what's going on here, but the guy on the left's probably none too happy about it. 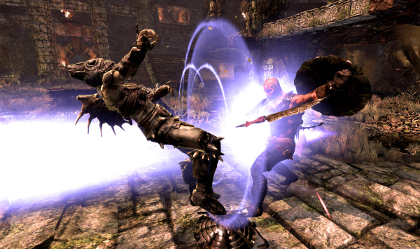 The demo devoted most of its time to the nuts and bolts of ranged combat: the game’s melee controls remain something of a dark spot, though melee itself looks satisfyingly visceral, with blood splashing all over character models and shields disintegrating after one hammer-blow too many. There were also hints of still grander scenarios further along the line, monstrous humanoid outlines glimpsed briefly in the far distance. InXile has a solid pedigree when it comes to fantasy fiction, and its mastery of the long-running Unreal Engine should be evident from the screenshots. Assuming the new game’s slightly past-their-sell-by-date combat principles are appropriately explored, the hunt for a decent Diablo substitute could be over. Hunted: The Demon’s Forge is coming to PC, PlayStation 3 and Xbox 360. Release dates have yet to be announced. 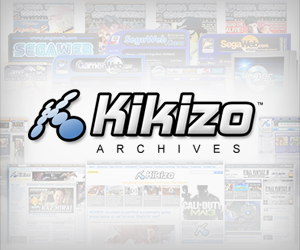 Our rather lengthy interview with the developers will be live soon. Posted in Previews, Spotlight, and tagged with Bethesda Softworks, Brian Fargo, console, Europe, InXile Entertainment, North America, PS3, Windows, Xbox 360. Looks/sounds like a lot of fun. Hopefully the game has a robust random loot table to ensure re-playability! 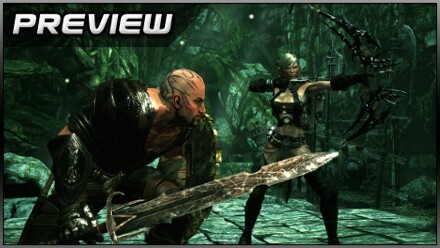 Not sure if there’s been any mention of randomized dungeons…again, while not every dungeon needs this, perhaps a few here and there would help players to continuing exploring/fighting.